QLD0593 series are compact visible laser modules, which integrate 1064-1188nm lasers with SHG (second harmonic generation) devices of PPLN (Periodically Poled LiNbO3). 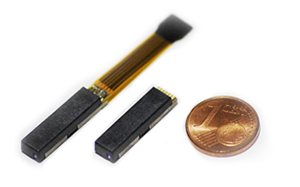 Different from a DPSS laser (Diode-Pumed Solid-State laser), this laser utilizes DFB laser technology, which provides video rate amplitude modulation capability and narrow spectral linewidth. These features are ideal for projectors and microscopy and are also suitable for spectroscopy and sensing applications.